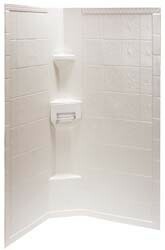 Made to fit and complement hew-shaped shower bases. Lightly textured material allows for easy cleaning, and helps prevent scuffs and scratches. No caulk or trim necessary. Features tiled look. 3 year warranty.